This is all the plastic debris collected from the stomach of ... ONE albatross on Midway Island, photographed by Cynthia Vanderlip -- about 2800 miles WSW of San Francisco, 2200 miles E of Japan, 1200 miles NW of Hawaii. The black objects on the right are the normal food items -- squid. 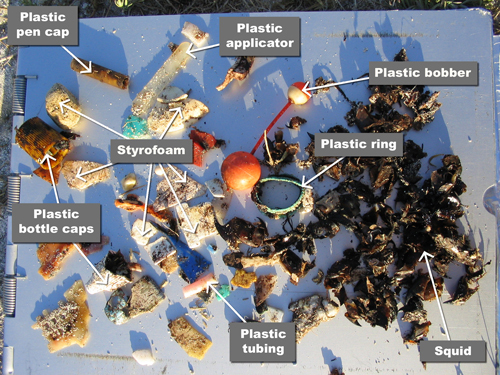 Clearly half of the contents of this stomach was human debris, mostly plastics. It was the same story on almost every island we explored during this expedition. Although thousands of miles from the nearest outpost of civilization, the landscape is littered with the discarded products of human society: cigarette lighters, golf balls, glass, rubber, toothbrushes, clothespins...the list is endless, and dispiriting. I am reminded of the title of a book by the philosopher, Hannah Arendt: The Banality of Evil . For these are not ruins of a heroic age, but middens of a culture of distraction and disposability. They are mundane, trivial, unnecessary-and fatal. THIS is what we meant when we titled our slide show "Pristine?" with a question mark. The travel brochures will try to tell you there are far and distant seashores untouched by humanity. We don't want to ruin your dreams, but the time has come to snap out of the fantasy and realize it is no longer true. The litter -- especially the plastic debris -- is EVERYWHERE. Does anyone remember this woman? In 1965 she made an entire nation wake up and realize the highways across the country were disgracefully littered. She spearheaded the "Keep America Beautiful" campaign which lives on today. The world's oceans are now like America 's highways once were, adrift in litter. And the effects on wildlife are shocking. Captain Charles Moore is one mariner who is hard at work documenting the extent of the litter in the sea from his research vessel Alguita supported by the Algalita Marine Research Foundation . In June, Anna Cummins was aboard for a cruise to Guadalupe Island off Baja Mexico . She said they examined what was in the stomachs of 26 Laysan Albatrosses and found that ALL of them had large amounts of plastic -- from 30 to 60 percent of the contents. Is this a problem for the birds? Would it be a problem for YOU to eat 50% plastic? The answer is obviously yes -- the birds end up feeling full of food when they aren't, which leads eventually to starvation and death. You can read a lot about it in Carl Safina's excellent book, "Eye of the Albatross," in which he tells of watching an albatross mother regurgitate a green plastic toothbrush as it tries to feed its chicks. It is indeed very sad, but "pristine seashore" has become a contradiction in terms. Give that some thought.